“Wow…Would you be interested in being on the School Board?” Not a typical question for an art teacher to ask a parent at a High School Open House night. I have no interest in being on the Lower Merion School Board. It’s hard work to make everyone happy, and I’m not sure how much support I would get around the opinion I shared with my daughter’s art teacher. Last year I found the book I have been waiting 15 years for. It’s called Stealing Fire. The authors studied flow and productivity for business and individuals and determined that creativity is the most important skill of the 21st Century. Technology is and has been, zooming to relieve humans of many of our past tasks. Yet still, our human minds are better than machines at imagining, creating, solving problems and making a better future when we see things we don’t like. The authors noticed that we have been training for skills in the workplace, skills that will soon be obsolete. We need to be training ourselves and our children in non-ordinary states of mind. That means training yourself to be able to put the habitual thinking aside for something new to emerge. It’s that state of mind that allows a great idea to pop up when you’re taking a shower. The school board invitation came from my daughter’s art teacher as I had expressed in my opinion the AP art class that he teaches is the most valuable class my daughter is taking this semester. I truly believe this. Not just because of the research, and many stories in Stealing Fire. I believe it because I know it. A drawing of a pair of scissors in my high school drafting class surfaced this week and reminded me. I did this drawing many years ago when I was about my daughter’s age. When I looked at it closely, I quickly remembered all the things I’d had to figure out and how that assignment pressed me to think differently. I took the scissors apart so I could understand the screw that held the blades together. I had to draw elevations that were measured drawings with dimensions but also my first perspective. I remember the challenge of this drawing, the guidance of my teacher and the frustration. (I got a 95% because I forgot to draw one hidden line!) Mostly I remember the excitement when I finished it. Recently I have been sewing and making patterns, writing down ideas for programs, creating a big new presentation and learning to dance the West Coast Swing. Some of these things I am doing well, and others, like dancing are brand new for me. I am still clumsy, step on my partner’s toes and forget the steps. 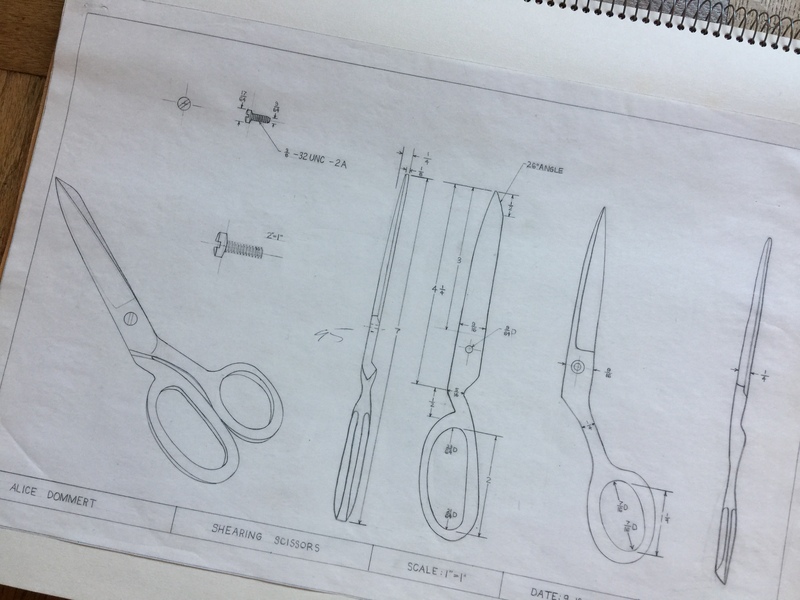 It feels uncomfortable but the drawing of the scissors reminded me I am still willing to be a student, to be a beginner and to trust that I’ll figure it out. Whatever it is, dancing or a presentation or life, I know I can figure it out. This week I invite you to lighten your heart, dance, draw a pair of scissors, or try a new yoga class. It just might be ridiculous and terrible fun.